House of Virgin Mary in Ephesus was not known till Anne Catherine Emmerich's vision. The paralysed German nun who had never been to Ephesus had a vision of the House of the Virgin Mary and described it in detail to the German writer Clemens Brentano who later published a book about it. Catherine Emmerich died in 1884. In 1891 priests and historians from Izmir read about her vision and found a little building which corresponded with Emmerich's descriptions. Archeological evidence showed that the little house was from the 6C AD but that the foundations were from the 1C AD. Proving that some people restored this home. 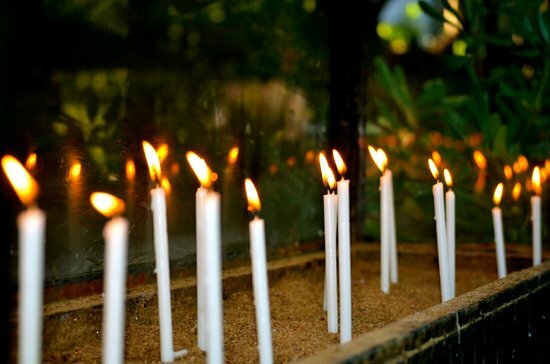 What was intesting that every year on August 15th some villagers came here and made ceremonies under the name Panaghia Kapulu. First they were asked why they make these ceremonies. Like so many in the world without knowing what Christmas of Easter means, they did not have any clue. Historians searched the word Panaghia Kapulu and found out that it means Virgin's Door. August 15th, still celebrated as the assumption date of Virgin Mary. From these indications they thought this is the house that Virgin Mary spent her last years. The house was officially declared a shrine of the Roman Catholic Church in 1896, and since then it has become a popular place of pilgrimage. It has been running as an active chapel over a century. Pope Paul VI visited the shrine in July 26th 1967. After Pope's arrival approximately 1.5 million people from different faiths and religion visit this house. 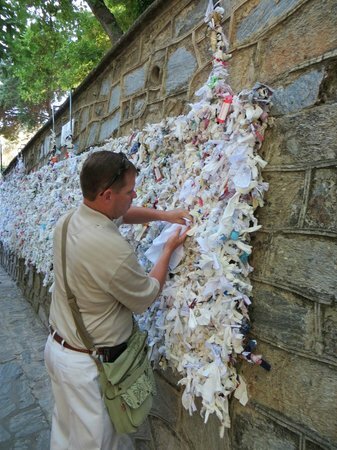 The other indication that Virgin Mary died in Ephesus is the writing of John of Damascus in 8th century. John mentioned that in 458 AD Queen Pulcheria requested Bishop of Jerussalem to transport the sceleton of Virgin Mary to Constantinople. When St. Paul arrived in Ephesus in 53AD he found there people who had already been evangelized. It is likely that Virgin Mary and St. John arrived Ephesus beween 42-48AD. The presence of the Tomb of St. John and St. John's Basilica in Ephesus: Jesus Christ, before dying on the cross, entrusted to St. John his mother (John 19:26-27). It is believed that after the crucifixion of Jesus, St. John left Jerusalem and came to Ephesus, one of the biggest and safest cities of its time (capital of the Asia Minor province of the Roman Empire), and built a small hut for Virgin Mary just outside Ephesus in order to protect her from the non-Christian community of Ephesus. 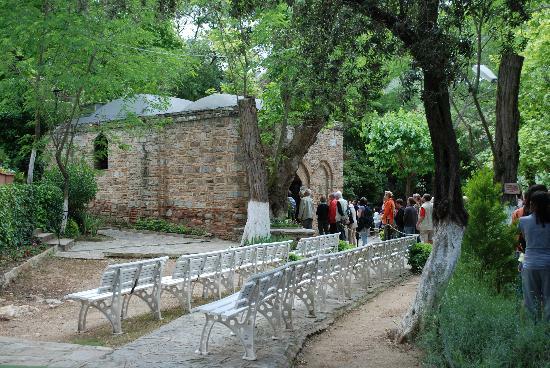 The presence of Church of Mary, the first basilica of the world dedicated to Virgin Mary, in Ephesus: In the early centuries of Christianity, places of worship were dedicated only to persons who lived or died in the locality. ntrance fee for House of Virgin Mary is 25 Turkish Liras per person. 25 Turkish Liras is approximately 7 US$ or 5.5 Euros. Credit Cards are not accepted. Travellers must have Turkish Liras cash with them. Mary, as mentioned as Meryem in the Book of Quran, is considered as the mother of Jesus (Isa), is the only woman named in the Quran, which refers to her seventy times and explicitly identifies her as the greatest of all women, Stating as "O Mary, God has chosen you, and purified you; He has chosen you above all the women of creation." The Quran calls Mary "the daughter of Imran/ According to an Islamic scholar, Mary's mother was named Hannah, and Imran, her husband, died before the child was born. Expecting the child to be male, Hannah vowed to dedicate him to isolation and service in the Temple. However, Hannah bore a daughter instead, and named her Mary. The birth of Mary is narrated in the Quran with references to her father as well as her mother. Mary's father is called Imran. He is the equivalent of Joachim in Christian tradition. Her mother is called Hannah, which is the same name as in Christian tradition (Saint Anne). Muslim literature narrates that Imran and his wife were old and childless and that, one day, the sight of a bird in a tree feeding her young aroused Anne's desire for a child. She prayed to God to fulfill her desire and vowed, if her prayer was accepted, that her child would be dedicated to the service of God. The Quran narrates that Mary grew up in the temple of the prayer, and had a special place in the temple of her own. ​The virgin birth of Jesus is supremely important in Islam, as one of the most important miracles of God.